GDAL includes a resampling method beyond the normal mix of nearest neighbor, bilinear, cubic and splines: "Lanczos windowed sinc resampling". I understand that its a convolution filter, but unlike images where results tend to be subjective, the resampling used for spatial data has other implications. What's Lanczos and how does using it affect the output? These operators work separately in each color channel. Therefore it suffices to study how they work on a monochromatic ("black and white") image. Most convolution operators used in image processing work the same way in the x and y directions and independently in both directions. In effect, they are really one dimensional operators applied first to the rows and then to the columns. This means we can study them by studying "1D" images, which can be plotted in detail. Everything we need to know about a linear operator (which includes all convolution operators) can be inferred from how an operator works on the simplest non-constant image of all: this is a sudden jump from one value to another. Let's look at an illustration of several popular resampling methods. Actually, we need two illustrations: one to show what happens in "downsampling," where the new image is coarser than the old, and another to look at "upsampling," where the new images is refinement of the old. Let's start with the latter, because it shows more detail. Using lightness to depict image values, although natural, is not very precise. The next illustration rectifies this by graphing the cell values (vertical axis) by column (horizontal axis). Lower values on the graphs correspond to darker parts of the images. A thoughtful examination of the original uncovers a hidden assumption: although the original image looks like a sharp jump from dark to light, the jump actually occurs over one-seventh (1/7) of the extent of the columns. Who is to say what really happens in that interval in the original scene the image is depicting? We therefore should not be too critical of differences among the resampling methods that occur within this short interval: each one is giving a different but potentially equally valid rendering of what might be occurring in the original scene. In this sense, it is no longer apparent that nearest neighbor sampling is the most faithful interpolation method. One conclusion we should draw is that the accuracy of any upsampling method depends on the nature of the underlying scene. If the scene consists of values that should smoothly vary from one point to the next, then the nearest neighbor method is likely to be the least faithful way of resampling among those shown. 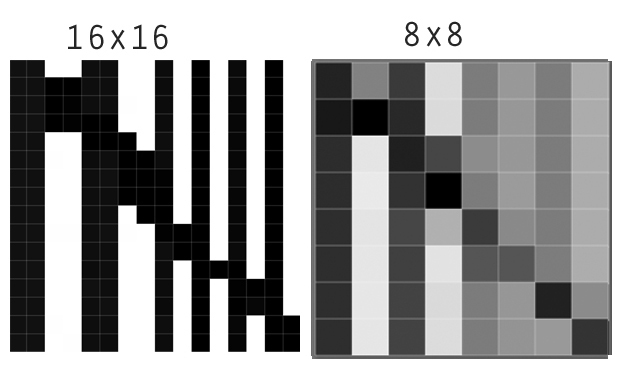 The bilinear, bicubic, and Gaussian resamplers show characteristics of convolution operators that have all positive weights (or very small negative weights): they average, or "smear," neighboring values. In downsampling this causes sharp features to be blurred. The extent of the blur depends on the width of the kernel. Like these others, the Lanczos resampler also blurs the jump, but it "overshoots" it on both sides. That's the contrast enhancement seen just above in the images themselves. Because of this tendency to increase contrast (the local differences between the highs and lows in the image), the Lanczos resampler is often called a "sharpening filter." These graphs show that this characterization requires a nuanced understanding, because evidently it does not actually reduce the averaging of values on both sides of the jump. At pixel 4, its value of 0.56 is comparable to the values computed by the other convolution filters. How does using it affect the output? Let's take a look at what happens in a more complex image. 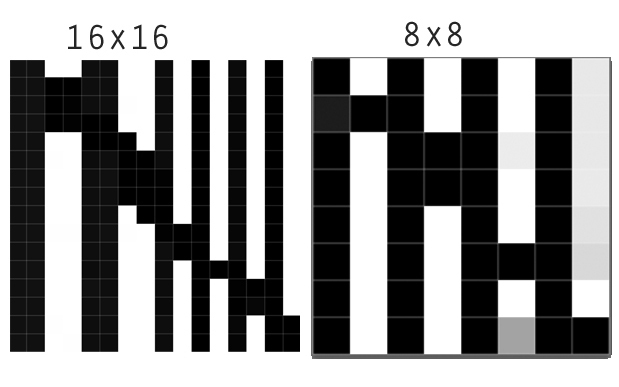 The original, which is a 13 by 13 image now includes a pattern with the highest possible spatial frequency (alternating between light and dark with every column at the right). We cannot hope to reproduce such features when downsampling: the smaller amount of pixels simply cannot hold all this information. Let's focus, then, on what happens when such an image is upsampled. If we care about faithful reproduction of the scene, we will want this high-frequency pattern to be reproduced accurately. The smaller images are resampled to 25 by 25 pixels: almost, but not quite, a 2:1 refinement. To my eye, the Lanczos and bilinear methods reproduce the stripes most sharply among the four convolution resamplers. Nearest neighbor is, of course, the most faithful (because it cannot average values at all). These graphs of the same results show that the Lanczos resampler was able to maintain the contrast in the stripes (as seen by the size of the vertical swings from lows to highs) at the expense of introducing a variation of intensity within the constant-value light area in the middle of the image (pixels 5, 6, 7 of the original). This variation shows up as stripe-like artifacts within the light part of the image (the middle). Of the resamplers shown here, it is alone in introducing such spurious detail. What is it useful for in a spatial application? Evidently, Lanczos resampling is not a panacea or omnibus solution to resampling. It is superior to many other convolution resamplers in maintaining (or even enhancing) local contrast. This can be useful when the resampled image is intended for viewing identification of detailed features or boundaries. When the resampled image will subsequently be analyzed or processed, Lanczos resampling may increase the ability to detect edges and linear features. When the resampled image will be analyzed in other ways, though, the benefits of Lanczos resampling are doubtful. It typically will (artificially) increase local measures of spatial variability, such as focal ranges and focal standard deviations. It will not affect spatial means on the whole--like the other convolution resamplers, it is usually normalized (which means it's a local weighted average, with no bias introduced)--but it may increase some local averages and decrease others compared to the other resamplers. The (necessarily brief) evaluation here suggests the Lanczos resampler generally should not be used for downsampling: for that application, it appears to offer nothing that simpler (and more commonly available) methods have, which retaining the potential disadvantage of extrapolating beyond the original range of data values. The investigation described here is an example of what anybody can do when they have a question about how a GIS operation works. It uses the GIS itself as the subject of the investigation: to know what some operation or analytical method does, simply apply it under controlled experimental conditions. In this case that amounts to constructing simple test images, resampling them according to available methods, and examining the results. Practice. By using our GIS itself to perform the experiment, we are able to see what it actually does. This avoids disconnects between theory (which tells us what the software should do) and practice (which is what it really does). Quantification. Unless the question concerns visual perception, for evaluating the results we should not rely solely on looking at maps (or, in this case, images). To get the best information, we need to quantify the output (done here with graphs) and, often, describe and summarize it with statistical methods. You might know Lanczos filters or similar type of filters from your image programs, where they are often called 'sharpening filters'. A good example from this forumtopic: The first image shows the original file, and next to it how it would look like after reducing the grid size if you use a smooth interpolation method (like bicubic downsampling). However, if you apply a Lanczos filter to this image, or use it to resample, the differences are amplified, you could say that the contrast is locally increased. In the case of spatial data this can be very useful: imagine you are trying to reduce a gridded polygon map, or if you want to run algorithms which rely on edge detection (eg digitize a scanned polygon map, image segmentation (example) ). On the other hand, you nay loose some spatial accuracy. Imagine that the 16x16 map represents air pollution in a city, than the resampling which uses the mean will more adequately represent the mean air polution within that grid cell. Lanczos resampling (Hungarian pronunciation: [ˈlaːntsoʃ]) is an interpolation method used to compute new values for sampled data. It is often used in multivariate interpolation, for example for image scaling (to resize digital images), but can be used for any other digital signal. The Lanczos kernel indicates which samples in the original data, and in what proportion, make up each sample of the final data. The filter is named after Cornelius Lanczos, because he showed how to use Fourier series and Chebyshev polynomials for various problems where it was not used before. Application: The Lanczos filter is a windowed form of the sinc filter, a theoretically optimal "brick-wall" low-pass filter. The sinc function is infinite in extent, and thus not directly usable in practice. Instead, one uses approximations, called windowed forms of the filter, as discussed in window functions: filter design, and the Lanczos filter is one such windowing. The windows vanish outside of a range, and using larger ranges allows one to improve accuracy in exchange for more computation. Evaluation: The Lanczos filter has been compared with other filters, particularly other windowing of the sinc filter. Some have found the Lanczos (with a = 2) the "best compromise in terms of reduction of aliasing, sharpness, and minimal ringing", compared with truncated sinc and the Barlett, cosine, and Hann windowed sinc. Limitation: Because the kernel assumes negative values for a > 1, output values can be negative even with non-negative input. Negative values are out of bounds for image signals and cause clipping artifacts. Negative lobes also induce ringing artifacts. However, both undershoot and ringing are reduced compared to the (non-windowed) sinc filter, due to the windowing; the ringing is particularly small, as the positive side lobe size demonstrates, especially for a = 2. Not the answer you're looking for? Browse other questions tagged raster gdal resampling or ask your own question. Deciding what interpolation method to use for resampling raster data? Poor image quality of raster pyramid files in ArcGIS Desktop (no anti-aliasing)? What is the kernel width of the gdalwarp resampling methods? What resampling method is used in gdal_merge?